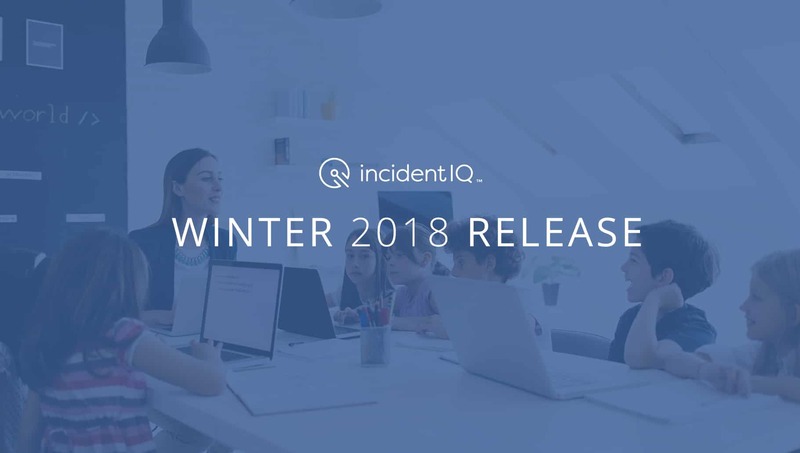 ATLANTA (February 6, 2018) — Incident IQ unveils the latest enhancements to its leading K-12 technology support platform in its Winter 2018 release. Incident IQ—more than a help desk—is the cloud-based technology support platform that empowers school districts to effectively support all the hardware, software and systems that teaching and learning depend on today. New features in the Winter 2018 release deliver upgraded functionality for teachers, IT and systems support teams, and district administrators. “We listened to teachers, technology support professionals, and district leaders in schools around the country, to continue to enhance Incident IQ in fundamental ways to achieve our shared goal of providing the best support for teaching and learning there is for K-12 classrooms,” said Jason Martin, Incident IQ Chief Software Architect. The Ticket Wizard (for submitting help requests) has been further streamlined and enhanced—enabling users to submit a support ticket in under one minute. Now Smart Search auto-populates results as users type, allowing quick selection in a few keystrokes. Quick Tickets allows users to submit tickets directly from their user dashboard with one click for the hardware and software they depend on daily. Users can designate favorite devices and software, making them immediately accessible from the Quick Tickets section. Ticket Templates allow agents to generate tickets from pre-defined templates, making it easier to quickly create tickets for repetitive tasks like setting up a new user’s profile within the district’s IT environment. Additionally, a ticket template can be configured to execute at some future time, or to create a ticket according to the template on a recurring basis. This is perfect for regularly occurring preventative maintenance tasks. Incident IQ’s Analytics Explorer has been enhanced to provide an even greater insight into a district’s technology performance. New overview pages allow leaders to quickly generate side-by-side comparisons of locations, agents, or model performance. Incident IQ’s enhanced Service Level Agreement (SLA) management tools allow for easy SLA implementation, monitoring, and reporting. More than a help desk, Incident IQ is a technology support platform that enables school districts to manage all the hardware, software and systems that teaching and learning depend on. Incident IQ is built from the ground up for today’s K-12 with simple ticket submission for teachers and students, efficient workflows for support teams, and powerful analytics for leaders. Learn more at incidentiq.com. INCIDENT IQ and the stylized INCIDENT IQ logo are trademarks or registered trademarks of Lexicon Technologies, Inc. All other trademarks are the property of their respective owners.